For a franchise that began its existence about as badly as possible, the last two decades (22 years, to be exact) have played out rather well for the Miami Heat. The Heat entered the NBA in the 1988–89 season with a roster packed with legendary names that are still uttered in NBA circles- Rony Seikaly, Kevin Edwards, Grant Long, Sylvester Gray, Rory Sparrow, Jon Sundvold and Pat Cummings. With such an arsenal of weapons, it’s little wonder that the Heat lost their first 17 games- at the time an NBA record- en route to a league-worst 15–67 record. While there was at least a glimmer of hope when the Heat finally won that first game against the Clippers (had to be them, didn’t it? ), there was probably not too many fans expecting the next two decades to bring a pair of franchise centers, a shoo-in first ballot Hall-of-Fame two-guard, three trips to the conference finals, an NBA championship and the union of two of leagues four best players (and three of the top-20), in their respective primes, looking to stockpile rings. Say what you will about the Heat, Pat Riley, Miami as a sports town or the performances LeBron and Chris Bosh in July 2010, but after an inauspicious start to life the NBA, Riley managed to make the Heat relevant pretty quickly, and he’s outdone himself (with the help of some ping-pong balls in 2003) in keeping them there. 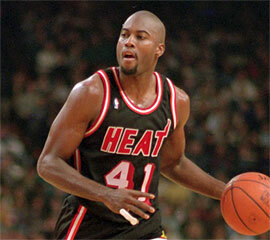 Until Dwyane Wade came along, Tim Hardaway held the title of best backcourt player in franchise history. Not only did Hardaway put up some outstanding individual numbers in Miami, he was running the point when the Heat finally broke through with some team success. In each of his five full seasons in Miami, the Heat won at least 60% of their regular season games, won four division titles and made their first-ever trip to the conference finals in 1996-97, falling in five games to Michael Jordan’s fifth title team. 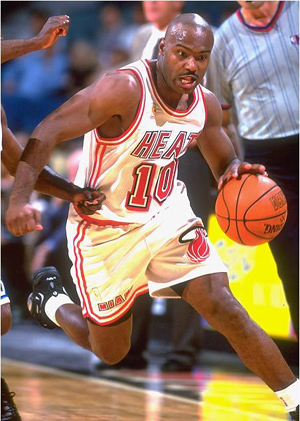 Hardaway also made a pair of All-Star teams as a member of the Heat, and earned the only 1st Team All-NBA selection of his career in 1996-97, when he averaged 20 ppg and 8.6 apg for a team than won 61 games- a franchise-record that still stands. Among backcourt players, Hardaway ranks second in points (6,335), third in rebounds (1,180) and held the franchise record for assists (2,867) until January 16, 2010, when he was surpassed by Dwyane Wade. While Hardaway was a reasonably easy choice, he faced some pretty stiff competition from Sherman Douglas (16.0 ppg, 7.9 apg, 1.7 spg in 159 games), who started his career with a pair of strong seasons in Miami. Douglas actually holds a small edge in both assists and steals, and his scoring average is just a point shy of Hardaway’s, despite attempting more than two fewer shots per game. Yeah, Eddie Jones and Steve Smith were pretty good, but there's no need to even have a conversation here. Not only does D-Wade win this spot in a landslide, it’s safe to assume that if he’s ever supplanted here, it will be long, long time from now. Holds the franchise record for points (11,967), assists (3,126) and steals (862). Six-time All-Star. 2010 All-Star MVP. Two-time All-NBA 1st Team selection. Two-time All-NBA 2nd Team selection. 2009 scoring champion. Carried the Heat to the 2006 title, winning Finals MVP in the process. Not a bad resume. You know, if you’re into that sort of thing. All that aside, Dwyane Wade is just a truly great player. I find hard to be really articulate here. The fact is, Dwyane Wade is absurdly good. Really. Damn. Good. This guy knows how to play basketball, play it beautifully, and just happens to be blessed with a body and an exceptional skill set that allow him to do so at as high a level as anyone on Earth. Oh, yeah. And he’s still in his prime and is about to spend the next few years with the best supporting cast he’s ever had. One of the great shooters of his, or any, era. Rice was the star player in Heat history, and is still ranks in the top three in franchise history in games played (2nd), minutes (2nd), points (3rd), scoring average (3rd), 3-pointers made (3rd) and steals (3rd). How this guy never made an All-Star team while Miami is a mystery. Rice spent six seasons with the Heat, and in the last four didn’t average worse than 19 ppg and 4.6 rpg or make less than 38% of his 3-pointers. While he did go on to make three All-Star teams with the Hornets and win a ring with the Lakers, Glen Rice’s time Miami remains underrated. It will take a hell of a lot to pry this spot away from this native Floridian. A local guy with a blue-collar game who’s persevered through hard work to become a champion with the hometown team- the only NBA team he’s ever suited up for. More than anyone in franchise history, Udonis Haslem has shown a genuine commitment to the franchise and to the city of Miami, TWICE leaving EIGHT figures (an estimated $22M total) on the table in order to stay in Miami. 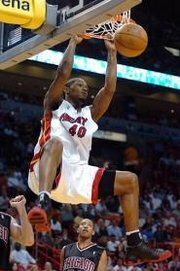 A Jacksonville native who attended high school in Miami and the University of Florida, Haslem signed with his hometown Heat as an undrafted free agent in agent 2003, after spending the 2002 season playing professionally in France. Of course, this was because his weight had jumped to more than 300 pounds upon his leaving college. During his season overseas, Haslem averaged a very solid 16.1 ppg and 9.4 rpg, but more importantly he lost 70 pounds, earning him an NBA summer league spot, and subsequently a spot on the Miami Heat- which he parlayed into an improbable NBA All-Rookie 2nd Team selection. He became a starter after the Heat sent its starting frontcourt (Lamar Odom and Caron Bulter) the Lakers in exchange for Shaquille O'Neal. 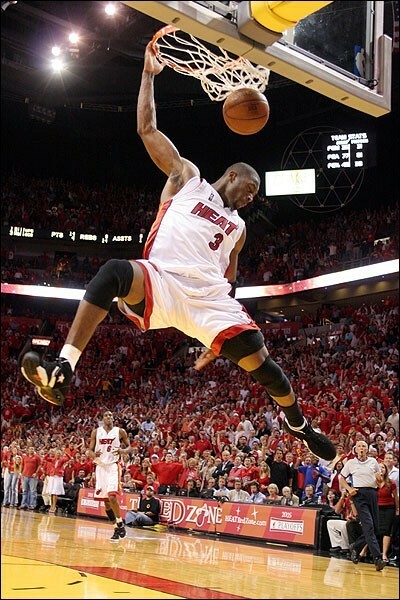 Haslem’s rebounding, hard-nosed play and newly developed 15 foot jump shot proved to be a perfect complement to Shaq and Dwyane Wade, as the Heat made a run to the 2005 conference finals against the Detroit Pistons. In 2005–2006, Haslem reassumed his role with the Heat, who built on the previous season’s success, reaching the NBA Finals, and beating the Dallas Maveraicks in six games. While Udonis Haslem’s legacy will likely be one of a humble, unsung hero, he was anything but in the title-clinching game. In Game against Dallas, Haslem was front and center, scoring 17 points as the Heat lifted their first championship trophy. Haslem is joined by Brian Grant and Grant Long to round out a solid-but-unspectacular group of Miami PFs. While Grant (11,ppg, 8.5 rpg in 312 games) and Long (11.6- 7 in 472 games) did put up some solid numbers in Miami, Haslem’s loyalty and sacrifice were too much to overlook. 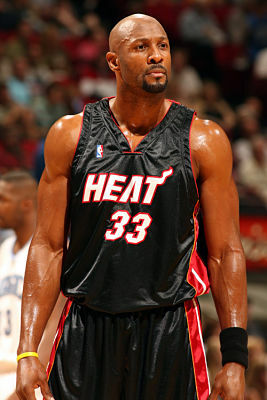 When the Heat began to actually matter, this guy was the main reason why. Pat Riley’s first big free agent splash as Heat President, Zo delivered instant credibility to the franchise, teaming with Tim Hardaway to transform the Heat into a perennial 50-win team and a contender in the East. With the exception of 30-game hiatus (over two seasons) with the Nets, Mourning spent a dozen years in the middle for the Heat and is still the franchise’s all-time leader in games played, offensive, defensive and total rebounds and blocked shots (1,625; next most is 610), and ranks in the top three in minutes (17,700; 17 fewer than Wade), points (9,457), FG%, FT attempted (3,894) and made (2,556). While a kidney illness and the arrival of Shaquille O’Neal drove down Mourning’s per game averages over his last four seasons, he averaged at least 19- 9.5 each of his first five seasons with the Heat. Zo also made five All-star teams and was selected to the All-NBA 1st Team in 1999, and 2nd Team in 2000. He was also named the NBA’s Defensive Player of the Year (and 1st Team All-Defense) in both 1999 and 2000. After being the heart and soul of the franchise for nearly a decade, it’s fitting that Zo returned to win a title in Miami in 2006. Speaking of which, Shaq was also a strong candidate here, putting up 19.6- 9.1 in his 205 games with the Heat and anchoring the paint for the 2006 title team. Although he has put up some numbers in his subsequent travels, this was the last stretch of Shaq’s career in which he was a genuine asset to contending team. A quick side question: when Shaq “handed” the Finals MVP trophy to Dwyane Wade after the Heat clinched the 2006 title, I can’t have been the only person who wanted Wade to crack the trophy over his head, right? By the way, in case you’d also forgotten as well- Rony Seikaly was REALLY good! He’s the only center in Heat history to average a double-double (15.4- 10.4 and 1.4 bpg in 439 games), and averaged better than 16 and 10 four consecutive seasons in the early 1990s.